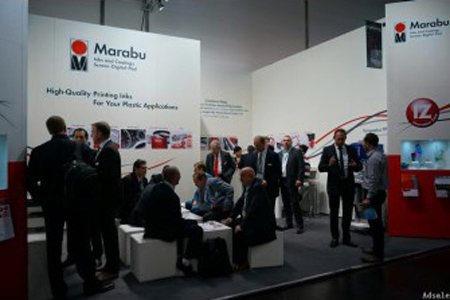 At K 2013, Marabu GmbH & Co. KG, a manufacturer of screen, digital and pad inks in Germany, displayed its tailor-made ink solutions for a variety of plastics applications. The demand for low migration inks rises along with the requirements for consumer protection, especially when it comes to toys, promotional gifts, or packaging such as beverage or baby bottles, notes the company. For such reason, Marabu displayed the ink system Tampaplus TPL, a very fast drying and resistant pad printing ink that was adapted to the latest regulations. It contains neither aromatic solvents, nor PAA, and features lowest PAH values, thus contributes to a consumer-safe packaging. Also free of aromatic hydrocarbons and halogens is the pad printing ink system TampaRotaSpeed TPHF. The ink fits for printing on bottle caps and captivates by its good printability, fast drying, and high resistance. Furthermore, Marabu’s low migration UV screen printing ink Ultrapack UVFP is suitable for printing on the exterior of food packaging and fully complies with the EuPIA Photoinitiator Suitablity List 1A as well as the Swiss Ordinance on Material and Articles in Contact with Food (SR 817.023.21.). Marabu says visitors at the K Show are showing increasing demand for UV-curable ink systems for In Mold Decoration (IMD). At present, solvent-based screen printing inks are the standard in IMD. But now the company is now able to present the first UV-curable ink system to offer a real alternative: Ultramold UVPC. Another important topic is the rapid UV curing for membrane switches. The ink system Ultraswitch UVSW guarantees all the advantages of the UV curing process such as unlimited mesh opening, stable color accuracy, and high production speeds, emphasizes Marabu. At the same time, it also meets stringent technical requirements of membrane switch manufactures. UV LED is set to play a more and more important role in screen printing. Today, UV LED lamps are already used for applications such as printing on labels or plastic containers. Used on hybrid machines, which combine screen, and flexo printing, Marabu’s UV LED-curable screen printing inks UltraPack LEDC and LEDX can be printed directly onto tubes. Another trend is towards digital printing. Where screen or pad printing were exclusively used for specific applications, now, the increased demand for solutions for digital printing is evident. According to this development, Marabu offers a wide product range of inkjet inks, especially the UV LED curable ink system UltraJet DLE-A and the traditional curable ink series UltraJet DUV-A. The suitable substrates include rigid materials such as acrylics, rigid PVC, aluminum composite panels (e.g. Dibond), polycarbonate (PC) or polypropylene (PP), as well as flexible substrates such as self-adhesive sheets or tarpaulins made of soft PVC. Marabu demonstrated its DLE-A at the booth by printing directly on advertising material with a Mimaki UJF-3042. The company also showed the water-based MaquaJet DA-E, an eco-friendly and easy-to-use ink for thin and sensitive plastic substrates. Marabu complemented its displayed product portfolio with liquid coatings, which offer unbeatable advantages compared to conventional film lamination.